Hello and thanks for looking at my profile. My name is Dan Church. I have been playing the drums, singing and involved in music since the age of 10. Over the years I've been in a wide variety of projects from a 'Top 40' Pop Band to Theatre Touring, Tribute Bands, TV Work and International Gigging. There's been glamorous venues and locations …. but like most musicians I've played hundreds of function gigs, theatre shows, corporate gigs and everything in between. This has enabled me to develop my backing and lead vocals, acting and even put on the odd wig! 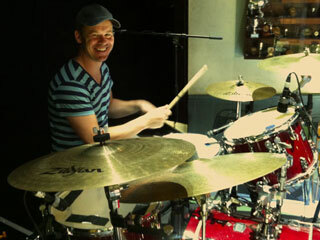 I'm not an ego head, just a jobbing musician who enjoys drumming and singing and brings passion to everything he plays. I'd like to think that I'm happy, helpful and my spirit flies high. To see me in action, click the trailer below and for more videos go to the video page.